Always check the weather forecast before waxing lyrical about the sunrise! This morning I was awoken at 5 by my alarm and the sound of pouring rain and ferocious wind. I peeked out the window into the misty grey but couldn’t see any sign of the sunrise. So I went back to bed! Today is Father’s Day so Ming and I went into the nursing home before lunch with our presents. Mine was a dozen oysters (which I picked up from the markets on the way in) and the DVD cooking series, Two Fat Ladies, which Anthony, Ming and I used to love watching. Ming’s gift was the English series, Doc Martin, and a bottle of champagne. Anthony finished the whole lot in about two minutes! My mother came in after church and helped us snack on crackers and some special cheeses I’d bought, with olives, cherry tomatoes and baby cucumber, then Ming arrived and gave Anthony the presents which were also a hit. A bit later, we played some of the DVDs and cracked the champagne but Ants only had a couple of sips before falling asleep in his chair. My mother had gone home by then and eventually Ming left. After that, I tidied and washed up the various plates and cutlery I keep in one of Anthony’s cupboards, then sat down to watch another episode of Two Fat Ladies with him, but he continued to sleep and, all of a sudden, I felt terribly flat and just wanted to come home to Ming, so I did. But Ming has now retired to his shed for the night and I am coming to terms with the fact that I am somewhat redundant in his life – perfectly normal of course but still hard. When Anthony wakes up will he wonder where I am after the frivolity of this morning? I told his favourite nurse, Denise, that this is the first time I have left without saying goodbye but I didn’t want to wake him as he looked so peaceful, so she said she would tell him. 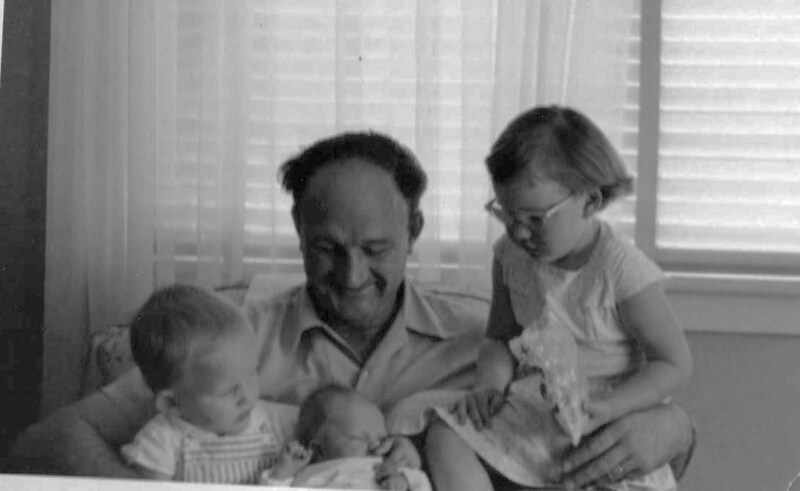 All of a sudden, even though he has been on my mind all day, I am consumed by the remembered agony of losing my father suddenly to a heart attack when I was nineteen and my younger brothers were seventeen and fifteen. Those brothers have become the most amazing dads to their children (five each!) I bet they think, with my mother, of our Dad today. He was a generous, beautiful gentleman. Anyway, back to the sunrise fiasco – I am just going to check the weather forecast for tomorrow …. And there was I, feeling very sloth like, thinking of you bounding out to see the sunrise! That sounded like a lovely Father’s Day for Anthony. Good on ya! And it is still stormy here! It was a terrible shock at the time for all of us. there will always be another sunrise, don’t despair – and people slow down in life, quite naturally, like a clock ticking it’s way through time. Glad the birthday party went so well though sorry about the weather. It is still wintery here despite being 8 days into spring! I watched the sunrise here this morning Julie — and thought of you — I too didn’t think to check the forecast… fortunately…. the skies are clear. Thank you for inspiring me. And you do, btw. You inspire me to move through each moment of the day with a compassionate heart, seeking to be kind and create better all around me. For that is what I see in you. that is what I see you doing. And that is what your ripple inspires in me all the way over here on the other side of the planet. Well it’s you I take my hat off to, Louise! Still wet and wintry alas! Julie, I am so sorry for the wrenching loss of your father. No matter how many years have gone by, the memory of the shock and grief remains. You have experienced a lot of loss recently and new loss can trigger those feelings. I know you’re keeping your chin up and may the beautiful memory you created with your sweet celebration stay with you forever. Memories do help to soothe the emptiness. Creating new ones when you are grieving just show how special you are. I’d get him oysters more often but sooooo expensive! Julie I love that picture of you and your brothers with your dad! Glad you all had a nice time. Anthony looks happy enough. The best thing is to look at the weather forecast to see what the weather is going to be like to save you getting up early. The oysters reminded me of the Mr Bean sketch when he ate oysters which were ‘off’. Hope Anthony’s were not ‘off’. Great photos of Ants enjoying. It’s the weather. It can affect your mood. Wind and rain brings on melancholy thoughts, just as the sunshine brings out happiness. It’s okay to feel that way as long as you don’t let it take over (and I know you won’t). You gave Anthony a nice Father’s Day treat with your visit and your treats. It’s as if the winter has returned! Sensible woman going back to sleep. 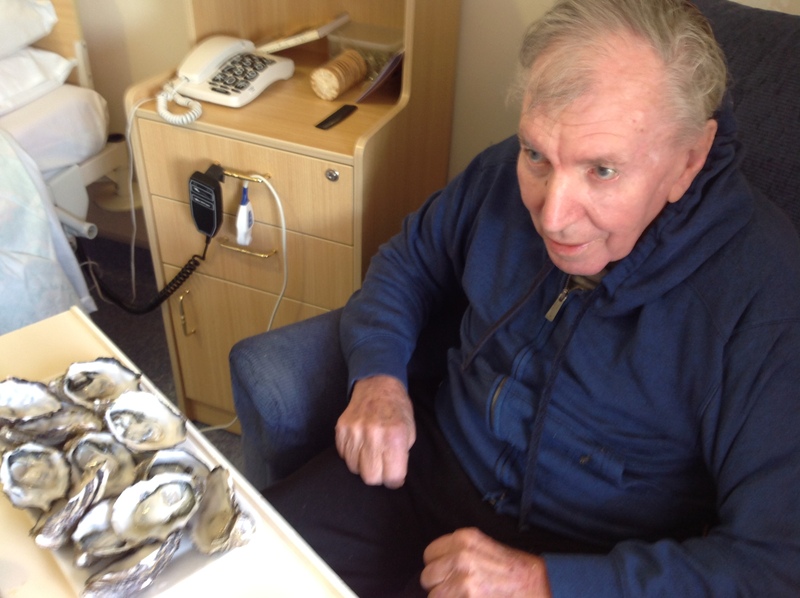 A lovely way to celebrate father’s day – oysters and champagne say it so well. That was a lovely Father’s Day for him, with lots of treats. It’s quite a difficult transition. What a lovely day for Anthony. I wore them for a year with a patch on one eye for a squint. I am sorry about the sunrise but there will be another day. Soon I hope. Summer can’t be far away. I think those few sips of champagne knocked him around! Oh, Julie, I SO enjoy your posts. Thank you. 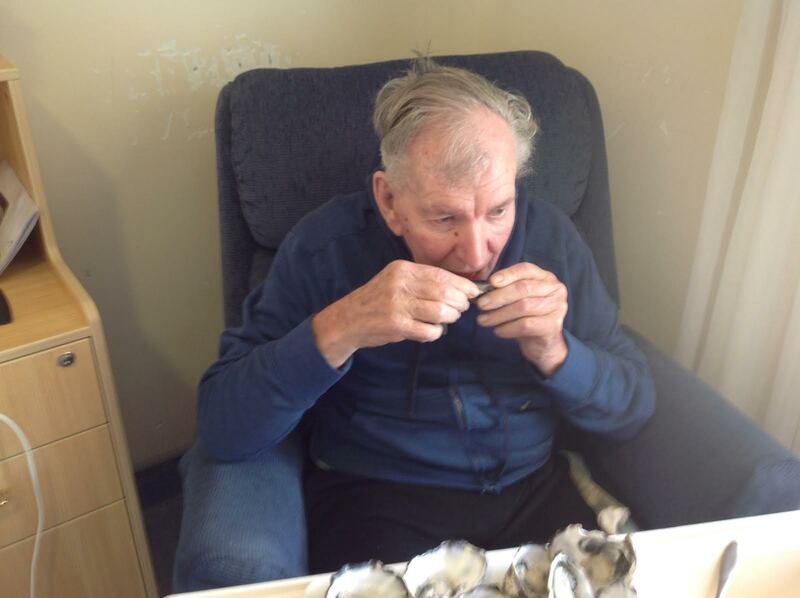 (I love oysters; I could eat a dozen of them in a flash! This is the thought I had as I was reading this post, Julie: All of these people have been lucky to have you in their lives. Now I am lucky to read your thoughts about them. Thank you so much. We had a beautiful sunny day over here in Tasmania for father’s day. However, it is pouring this morning! 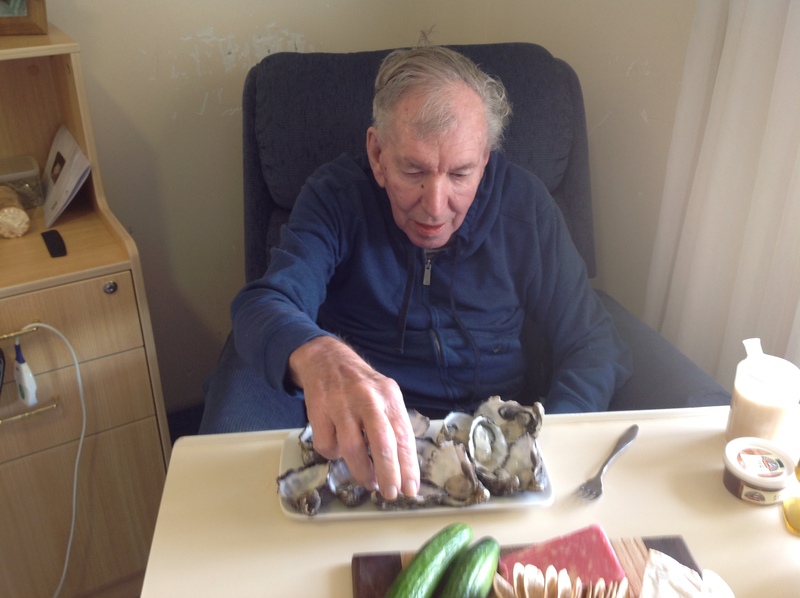 Oysters, what a great idea! Lately I feel like I have become a flat mate to my son, he’s so busy and I’m either busy or in need of rest, we hardly spend time together. I try to think back to when he was younger and I can’t remember him being a teenager, being at school or being little and what it was like as a mother then. It feels like a past life. So sad.